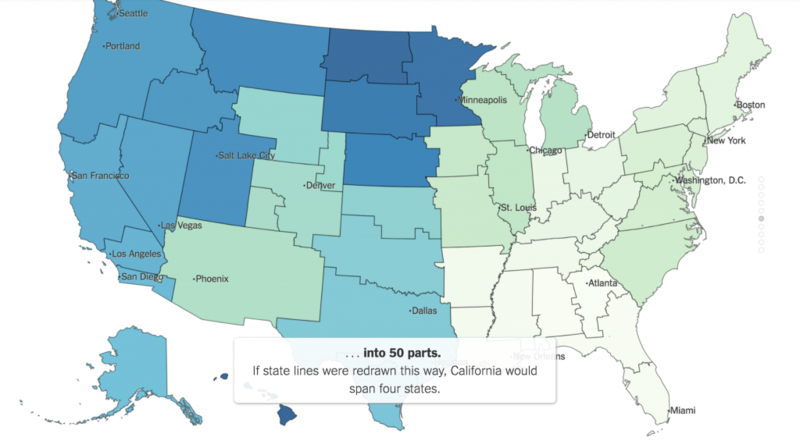 There was some debate about why state boundaries, which seem irrelevant in many ways as they don’t reflect real economic geographies (or often even cohesive communities) and are only sometimes on natural boundaries. Here again is are the 50 “Facebook States of America” from the NYT piece I posted last week. A lot of people went straight to the state university system as a reason for this. The argument is that people go in-state because it’s cheaper, and this creates Facebook networks. That’s probably some of it but the state boundaries foot to other data no so easily attributed to college. For example, here’s a migration map for Marion County (Indianapolis), Indiana, which is not where the state’s major universities are located. I think it’s easy to overlook how much of our life is essentially organized at the state level. Beyond colleges, high school sports are organized on a state basis, with state championship tournaments, etc. Occupational licensing is state based. Even where moving to another state requires merely some administrative activities, it’s still a pain. Even think about just getting a new drivers license, car title, etc. There are tons of associations organized on a state basis as well. Last week I spoke at the Association of Indiana Counties annual meeting. County officials from all over the state network and get together regularly. The same happens in other states. Similar associations exist across a wide range of professional and private sector activities. In short, there is a huge amount of institutional infrastructure at the state level that creates communities and networks of various sorts within states, but not between states. It strikes me that associations, etc. tend to be local/state, then national. There are fewer regional institutions, though some entities like labor unions have multi-state councils and regions. I have always been stunned at low little knowledge people – even high level political and business leaders – have of what is happening in the next state over. Given that this is the norm almost everywhere, it can’t be because of a uniquely provincial mindset or something, but probably arises from other forces like institutional infrastructure. This suggests to me that if you want to create any sort of regional or multi-state thinking or awareness, you need to create institutional infrastructure aligned around that which will develop networks that span state boundaries. The reason the university argument looks strong is that the state-level associations are stronger where state flagships are strong (i.e. the Midwest) and weaker where they’re not (i.e. the Northeast, and parts of the South). Yes, Indianapolis only has 1 of 3 major public unis in Indiana, but since West Lafayette and Bloomington are both tiny towns, UI and Purdue really feed people into Indianapolis and not into local work. The US really has only four significant interstate/regional entities: Great Lakes Compact (Minnesota, Wisconsin, Illinois, Indiana, Michigan, Ohio, Pennsylvania, New York) which is part of an international compact that also includes Ontario and Quebec; Appalachian Regional Commission; Tennessee Valley Authority; Colorado River Compact. Two of these are relatively organic (GLC and CRC) and the other two are somewhat overlapping creations of Congress aimed at Appalachia and the mid-south and their endemic and lingering poverty. It is no coincidence that the two organic ones are organized around watersheds and water resources, which do not generally respect political boundaries. Isn’t the Port Authority of New York and New Jersey another very significant interstate entity? Yes, and I shouldn’t have forgotten that one. There’s also a Port Authority for Philadelphia/Camden; I forget what it’s called. Delaware River Port Authority, that’s right. All that Aaron explains makes those places in which state boundaries don’t seem to order social connections all the more significant. The regional cohesion of New England and the Northwest suggest a greater degree of social capital in these regions. This has implications for politics and economics. The small scale of social networks in Appalachia suggest the opposite…a lack of social capital with which to achieve social, political, and economic goals. Also, does being located on a social boundary whether it’s also a state boundary or not, affect the institutions and experiences of life in those places? I’ve always understood Cincinnati as a cultural border town that is neither midwestern nor the upper south/cultural appalachia. Without a surrounding region to draw on, Cincinatians have turned inward creating an intensely defensive and insular society in the process.